A beautiful heart shaped custom photo locket necklace, the Katharine pendant features an ornate design with a heart shaped white topaz stone in the center, surrounded by smaller glittering stones. The namesake for our Katharine locket necklace is the iconic Katharine Hepburn. Aside from her incredible acting career, Katharine was a woman who rejected expectations and norms for women during that time and was a symbol for the "modern woman". This custom photo locket necklace is dedicated to all the independent, strong-willed women in the world. Set in either Sterling Silver or Rose Gold plated sterling silver. Locket pendant measures 19mm. Includes sterling silver custom photo locket pendant with white topaz gemstone and sterling silver cable chain. Available in chain lengths from 18" to 36". Our 18" through 34" necklace chains come standard with a 2" jump ring which may be used to shorten the chain by 2" and allows two length options. We put your picture in it! This unique custom photo locket pendant necklace is the perfect gift. Use your favorite picture to personalize your jewelry for any occasion. These antique photo lockets are an inspiration in a way that feels both modern and vintage. This collection of pretty lockets captures all the fine details and workmanship of a family heirloom in contemporary shapes and sizes. With You Lockets is a line of necklaces, pendants, bracelets, anklets, rings, bangles, dog tags, heart lockets and glass lockets all with a place to insert a special photo. 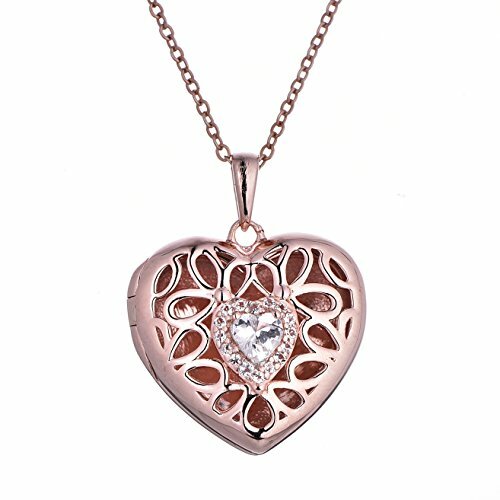 Our keepsake lockets are comprised of 925 sterling silver and 14k rose gold that hold photos. Produced with love and great care they are the perfect gift for celebrations, anniversaries, brides, bridesmaids, weddings, milestones, celebrations of life, memorials, births, graduations, Mother's Day, valentine's day and Christmas. Like the memory and love they honor, they are something to be cherished.